It's the day before school starts for the year and I am verklempt. On one hand, I am happy that the kids will get to bloom and grow and make new friends this school year but on the other, I am going to miss them around the house. I will miss the lack of routine and the late-night beach trips. As I stared at the fully packed backpacks I just knew something was missing. No, it isn't me trying to squeeze into the sack so I can see and participate with them constantly! Its a healthy, nut-free snack for the kids to bring to school. Oliver's kindergarten class is a nut-free classroom and as a Mom with two kids who can and will eat everything this can pose to be a challenge. It is hard when it comes to bringing in a birthday treat and my kids wants his favorite peanut butter rice krispy treats. Its hard when he wants to bring in apples and peanut butter for his daily snack. I do understand the importance of restricting these items in the room but its not easy for me to conform. As I thought about treats to buy for snack I kept thinking about granola bars. The kids love them and the best ones I have found for the price are the Wild Oats chocolate chip organic bars at Walmart for $2.19. That's not bad at all for a box of 6. I decided to make my own so that the kids could not only help and learn some new skills in the kitchen but I decided to do it so I could control everything in them. Since this was my first time making granola bars, to be honest, my expectations were low. Would they be brittle, would they be hard, would they be too tough or too chewy? Only time would tell. I whipped together my own recipe based on a thousand that I found. 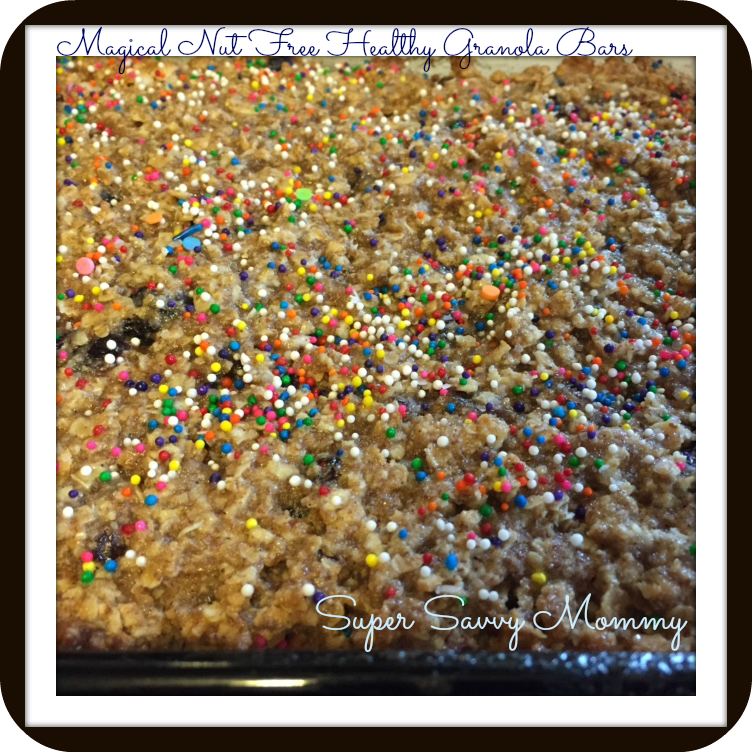 The result was a super soft, chewy and delicious granola bar that held its shape well and was so yummy that the kids would have eaten the whole pan had I let them. There are so many ways to make granola bars and if I was to make these for home I would definitely put some peanut butter and nuts in there but I am trying to be respectful at school! What are your favorite granola bars?